It is hard to say with exactness at which point in time tourism came to be. What is known, though, is the fact that it has been around for quite a while. Appearing in Rome during its height as a means for citizens to visit all reaches of the empire. These individuals would be easily distinguishable due to a unique pin that they would have attached to their chest. Something similar had also taken place in ancient Greece, where individuals would visit the different city states that existed at the time. Of course with the evolution of time, tourism as an industry had evolved and changed on a number of occasions. During the Middle Ages in Europe, religion devotion made it so that religious pilgrimages were a common sight, especially in Catholic-predominant countries. As time passed and societies evolved, the tourist industry expanded, trying to answer the different tastes in regards to leisure that individuals have: parallel to religious travels, that early version of tourism catered to those who needed to travel to cure their illnesses, like people traveling to Greece or Italy to heal from such conditions as tuberculosis. 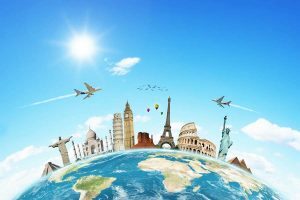 At present the tourist industry is a massive business that provides work for countless numbers of people all across the world. It should be noted that in many ways, these jobs are aimed at the people which didn’t go through higher tiers of education, as such they are quite crucial for economic and social stability in many places. As far as industries go, tourism represents a more sustainable means of economically developing a region, however in order for that to happen the location in question usually needs to have some kind of antropic or natural relevance. An important example of this can be seen in Europe, with countries such as Italy and France benefiting greatly from their touristic appeal. Italy for example having the resources given to it by its great history and at the same the appeal of the Mediterranean coast.